On June 19, 2011 I was fortunate enough to attend the Cal Camp at UC Berkeley. It was a great day working with the Cal Coaches and having the chance to snap to Cal Committed QB standout Zach Klein (#5 in green) too. 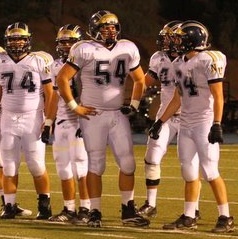 I am the Offensive Center in the navy jersey and gold pants with the navy strip. My helmet is navy too. Please check back for more camp updates soon. Thank You!